1991-01-07. New. Ships with Tracking Number! INTERNATIONAL WORLDWIDE Shipping available. Buy with confidence, excellent customer service! Scholastic Paperbacks. PAPERBACK. 0590444875 New Condition. . New. 1991-01-07. Good. Ships with Tracking Number! INTERNATIONAL WORLDWIDE Shipping available. May not contain Access Codes or Supplements. May be ex-library. Shipping & Handling by region. Buy with confidence, excellent customer service! Scholastic Paperbacks. PAPERBACK. 0590444875 Like New Condition. . Fine. Scholastic Paperbacks. Used - Like New. Like New condition. Scholastic Paperbacks. Paperback. 0590444875 . Very Good. 1991-09-01. 1. Scholastic Paperbacks. PAPERBACK. 0590444875 Ships from Tennessee, usually the same or next day. . Good. 1991. Scholastic Paperbacks. PAPERBACK. 0590444875 Ships from Tennessee, usually the same or next day. . Fair. 1991. Scholastic Paperbacks. PAPERBACK. 0590444875 1991 Scholastic; **4TH PRINTING; PB; Cover: shelf & edge wears, slight edge curl, o/w great; Fore-edge: age tanning; Content: page tanning, o/w clean, tight & unmarked; Ships Quick . Very Good. Scholastic Paperbacks, September 1991. Trade Paperback . Used - Good. Moderate wear. May have minor sticker residue or marks or writing. Our service is second to no other seller because we use easy to remove inventory tags and try to ship every day so your book arrives quicker! As a small independent book store in the Midwest we thank you for the support. Satisfaction guaranteed in all transactions. Let us know what we can do to help! Scholastic Paperbacks. Paperback. 0590444875 Very good minor creasing, some tan to pages. books carefully packed and shipped promptly . Very Good. 1991. Scholastic, 1991/09/01 00:00:00.000. Mass Market Paperback . Good. 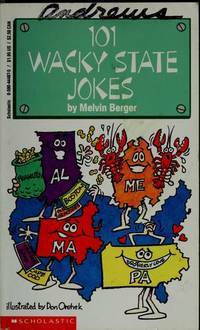 Berger,Melvin 101 Wacky State Jokes 'Edge and cover wear. Creases in spine,and cover.' All Orders Shipped With Tracking And Delivery Confirmation Numbers. Seller: Colorado's Used Bookstore, Inc.
Scholastic, 1991-09. Paperback, 96 pages, VERY GOOD.